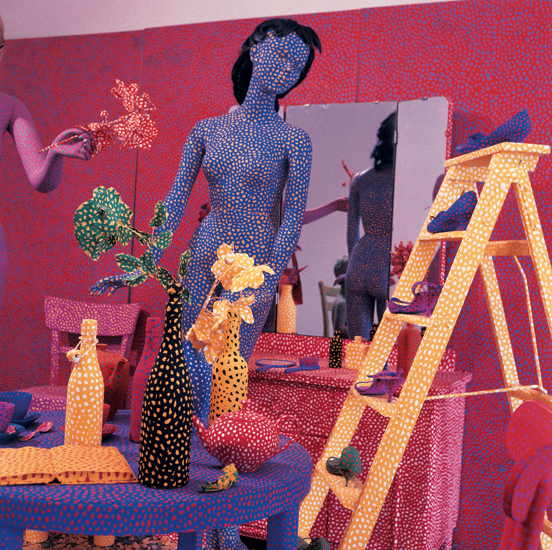 I am obsessed with Yayoi Kusama’s instillation art. She utilizes color and texture in a dynamic exploration of infinite space. Kusama creates the illusion of limitless space using polka-dots, lights, mirrors, water, and pattern to make endless reputations of texture, color and shape. She is able to trick our senses into perceiving her fictional environment— no matter how bizarre, garish, or fantastical— as reality. Right now she has exhibitions in three different countries, one at the Museum of Contemporary Art Shanghai (“A Dream I Dreamed”) until March, another in Japan at the Kochi Museum of Art (“Yayoi Kusama Eternity of Eternal Eternity”) until February, a third in New York (“Yayoi Kusama I Who Have Arrived In Heaven”) through December, and the last in Centro Cultural Banco do Brasil in Rio de Janeiro (“Obsession Infinita”) through the end of January. But Kusama has had a dynamic career in a variety of mediums, she continuous to evolve her art making techniques while still exploring boundaries and space with pattern and color. Kusama has had an incredibly successful international career. She started to paint around ten, creating richly textured paintings in watercolors, pastels, and oils using polka dots and nets as motifs. When she first arrived to the United States in 1957 she showed large paintings, soft sculptures, and environmental sculptures assembled from mirrors and electric lights. In the late 1960’s Kusama began to stage happenings in the US and Europe, such as body painting festivals, fashion shows, and anti-war demonstrations. In one happening she had participants dance to her choreography naked except for a painted polka dot pattern she applied. She also explored media-related activities, and in 1968 released the film “Kusama’s Self-Obliteration.” This film, in which Kusama produced and starred in, won a prize at the Fourth International Experimental Film Competition in Belgium and the Second Maryland Film Festival and the second prize at the Ann Arbor Film Festival. In 2008 her documentary film “Yayoi Kusama, I adore myself” released in Japan and screened at international film festival and museum. In 1973 Kusama returned to Japan where she continued to produce and show art works. During this time she became interested on language and book artand issued a number of novels and anthologies. In 1983, the novel “The Hustlers Grotto of Christopher Street” won the Tenth Literary Award for New Writers from the monthly magazine Yasei Jidai. for the rest of the 70’s and to present, she continued to expand her art productions and held many solo exhibitions, retrospectives, and museum exhibits in Paris, Australia, New York, LA, London, Brazil, Denmark, Rome, Milan, Mexico City, China, Tokyo, Korea, New Delhi, and even participated in the 1993 45th Venice Biennale and the 2012 Sydney Biennale and Aichi Triennale. She has had her work recognized by many titles museums and associations the world over. But perhaps being insanely prolific and successful does have its drawbacks. The rumor is that Kusama’s intensely patterned and bright art literally drove her insane. “Obsessions, phallus obsessions, obsessions of fear are the main themes of my art. Accumulation is how stars and earth don’t exist alone,” she explains. For the last forty years, she’s been a patient of a mental institution in Japan, where she continues to produce extraordinary works. This is an excerpt from project by filmmaker Heather Lenz, titled “Kusama Princess of Polka Dots.” Though the film remains unfinished, this 7-minute cut is a part of an exhibition on Kusama at London’s Tate Museum.